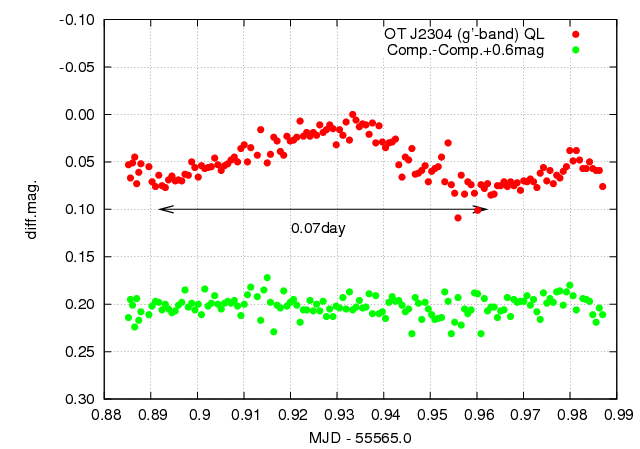 We obtained g'-band light curve of OT J2304 for 140 min on Jan. 04. 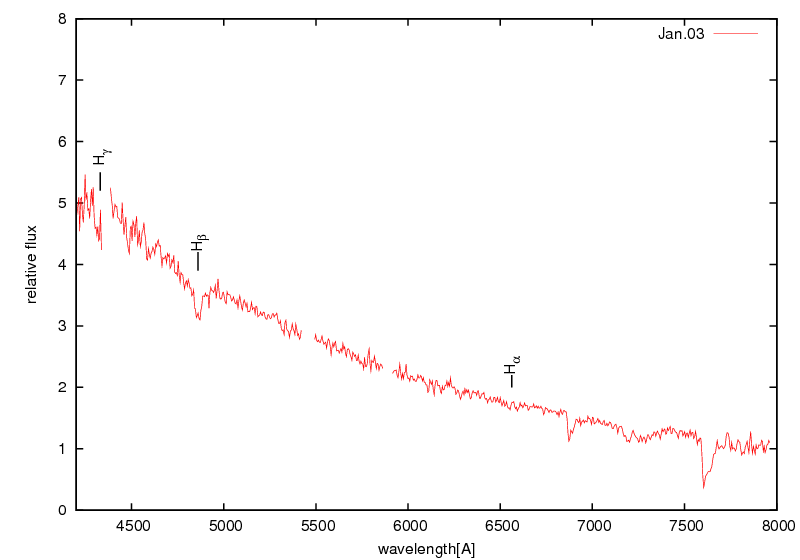 We detected a significant hump with amplitudes of ~0.06 mag in g'-band. A time duration of the hump is about 0.07 day in our light curve. More long-duration photometry are needed. We performed time series g'-band photometry of OT J230425.8+062546 (hear after J2304) for 2 hours on Jan. 3 using Araki telescope with ADLER. 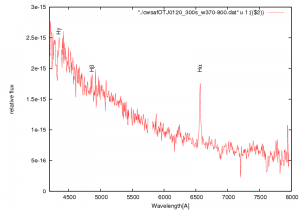 Our light curve of the object is shown in the figure(red data). 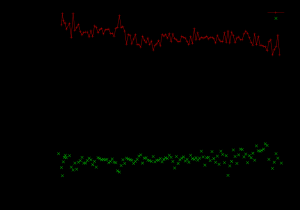 We possibly detected a small variation with amplitudes of 0.03--0.05 mag during our run. No other significant variations were detected. 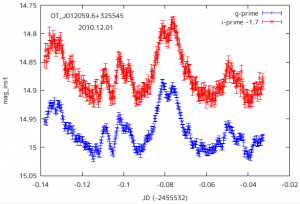 This featur of light curve was also detected at Osaka Kyoiku University tonight. 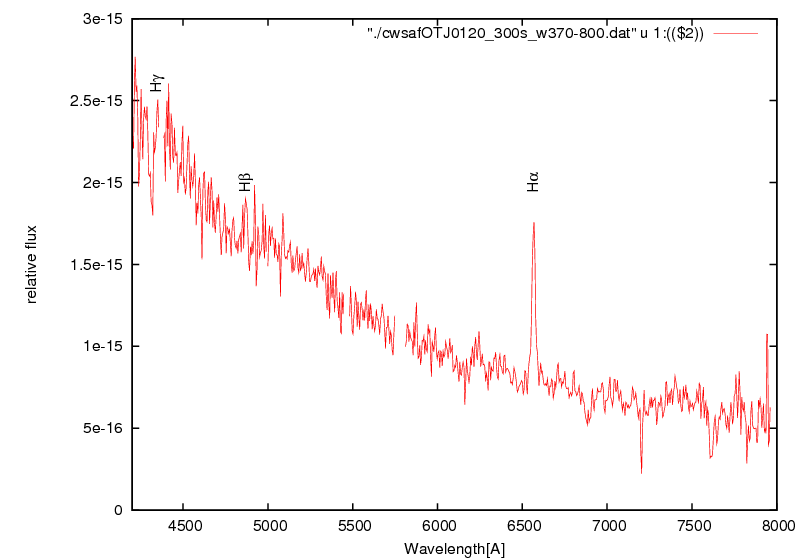 Spectra of J2304 suggest that it would be dwarf nova (c.f. CBET 2617 and our spectrum). 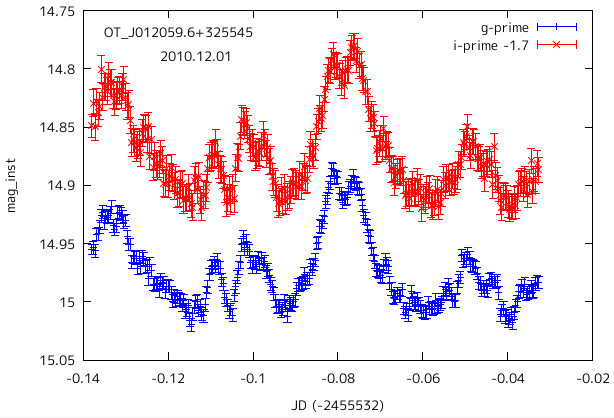 The current outburst of J2304 does not look like a normal outburst because of a large amplitudes. Ordinary SU-UMa dwarf novae show superhumps with amplitudes > 0.1 mag from its early phase. 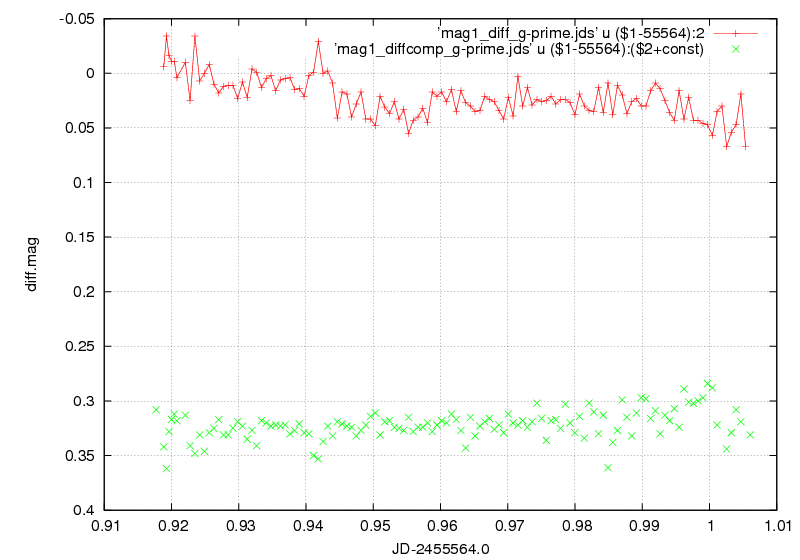 Our result implies that J2304 might be a WZ Sge star viewed nearly face-on. 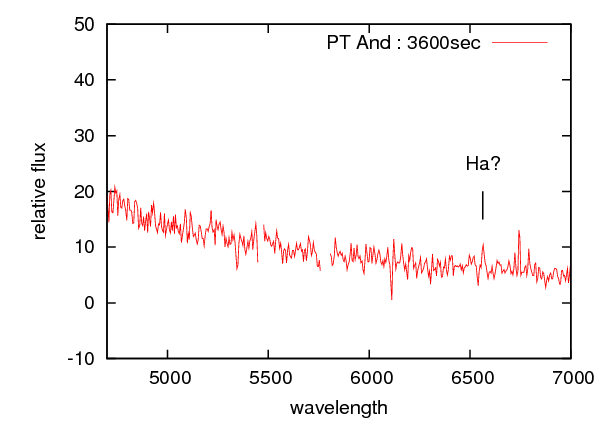 We obtained an optical spectrum of a new transient in Psc (= OT J230425.8+062546) using 1.3m Araki telescope with LOSA/F2(R~550) on Jan.03. The object was discovered by H. Nishiura on 2010 Dec. 29(c.f. CBET 2616). 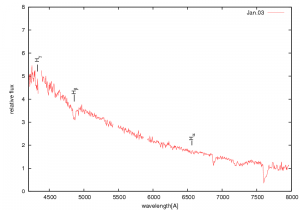 The figure shows our preliminary results of a spectrum of the object. 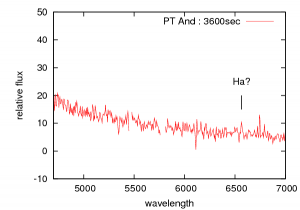 The spectra shows absorptions of H-beta, H-gamma and a emission of H-alpha on a blue continuum. 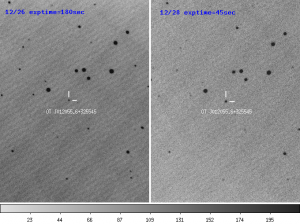 These results suggest that the object would be a dwarf nova as reported by the other observers (c.f. CBET 2617). 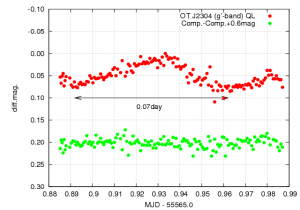 We performed simultaneous g'-i' photometry of a new WZ Sge star, OT J012059.6+325545 (vsnet-alert 12431, vsnet-alert 12346 ). The current bright outburst of the object was discovered by K. Itagaki on 30 Nov.(vsnet-alert 12341).